I did the clay model, covered it with plaster cloth, and then covered that with the slightly-altered air dry clay, all in one day. The next day it was dry (I put it over a furnace vent, so it had hot, moving air) and ready to paint. I could have used the shop towels and fast-setting paste for this mask, but I didn’t have any shop towels in the house, and I was too lazy to go buy some. The plaster cloth was sitting there on my shelf, so I went ahead and used it. I used two layers for the mask, except for the eyes, which got only one. Since the air dry clay was going over the plaster cloth, I knew it would be strong enough if I left just one layer in those two small spots. In case you’re wondering, I used the WED clay for the model/positive mold, but any modeling clay would work just fine. Well Jonni – out of all your pieces I think I love this one the most and have long had a plan to try it and today is the day I did one only I don’t like mine as much as yours. I will send you a picture and would appreciate critique. Have always really loved this leopard mask sculpt – wish you could demo the sculpting part. But then I’d have to do it all over. I don’t know why I didn’t take any photos when I was making it. Try doing it another way entirely = like using just wadded paper and tape. As to this beautiful mask _the one I did looks mad – wonder how I can get that look off mine? Must be the medium – I am using Celluclay which is the not the easiest sculpting medium but sometime I have success with it. Hi Jonni – long time no write. 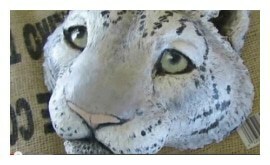 Anyway I am eager to view the video of how to paint the snow leopard head. Can you gift us with a detailed tutorial on how to do the snow leopard head ourselves? Would love that! Can you respond to this via my e-mail. Thanks. Hi Joanne. It’s good to hear from you again! I didn’t take any progress photos when I made the snow leopard for some reason, but it was made the same way as the gorilla mask. You can see that process here. 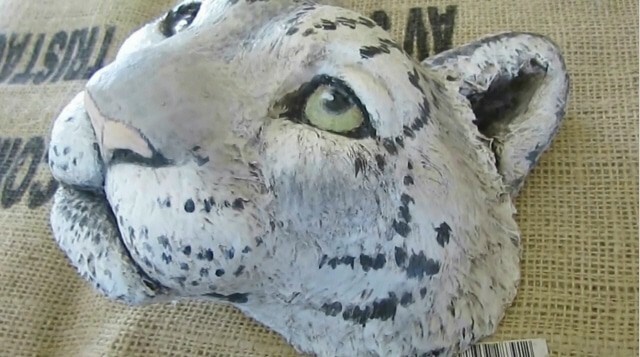 Love the snow leopard mask and really must have more on it than just your wonderful paint job. Please refer to my e-mail on this subject or give us some more on this site. What is of most interest is the way you sculpted her with the clay. Thanks much! Hi Jonni – I have viewed both the gorilla and leopard videos. Regarding the snow leopard would really love to see a how to video on sculpting the clay head. Also just when do you attach the ears – after you apply the layers of gauze to the head? Love your website! I’m rather new to paper mache sculpting and would like to know what tools you use for detail work? Also, is your paper clay supposed to be sticky or did I do something wrong? Thanks and have a great day! Hi Tina. Yes, the paper mache clay is supposed to be sticky – it’s intended to be ‘frosted’ over a crumpled paper and masking tape armature. If it isn’t sticky, it wouldn’t stay on the armature. If you like to work with something that’s stiffer, smoother and not sticky, try the air dry clay recipe instead. There are a few tricks to using it, since it isn’t sticky – like using a mixture of water and glue when adding new pieces of clay to a sculpture – but it’s easy once you get the hang of it. Thanks for the info Jonni. One more question…do I put the water/glue mixture on the dried mache clay before using the air dry clay to sculpture details? If you use the altered air dry clay recipe like I did for the snow leopard, leaving out most of the flour, you don’t need to add any glue. If you use the recipe with all the flour in it, it may not stick without the glue and water mixture. If it doesn’t want to stick, it will be obvious as you work with it. Jonni, thanks so much for this post. I especially appreciate that we get to see the process. I want to make a dog mask for my sister like this. It’s going to take some practice — and other projects seem to get in the way, like laying a floor and putting up trim (trying to make a house livable!). I loved the painting demonstration. The bit you showed about varnish was also helpful. I get bubbles some times, and I see how you worked the varnish around the eye. There are many small things like that in the video that are helpful. I love the leopard. Really nice mask. Thanks Rx. I’m glad you like it. It sounds like you’re doing the same chores I did when I moved last year – new floor, new trim, etc. My upstairs hallway had a drop ceiling slightly more than six feet high – that was the first thing to go. But I got sidetracked, and some of the trim still hasn’t been installed, even though the pieces are cut. Maybe next year…. Jonni, I really like your snow leopard. And hope to try and make one soon. Hi Jane. I used the air dry clay recipe, but I didn’t add all the flour the recipe calls for. I do, usually, but this time I wanted something that would just slide over the plaster cloth and cover the woven texture. So, in this case I ignored the last line of the recipe, where it calls for an additional 3/4 cup of flour. I have some WED clay and have been waiting for a free moment to use it with plaster bandages… I was wondering if you use any sort of barrier layer between the clay and the plaster cloth so that the plaster does not stick to the clay and to make it easier to remove the clay? I recall in one past project/post you had mentioned automotive wax but I have not heard you mention it since. I am wondering if you have found that step to be unnecessary. Thanks for sharing your knowledge and inspiration!! Hi Lisa. The wax didn’t help much, so I didn’t bother with it again. This time I used petroleum jelly, and the clay came out a lot easier. How hard was it to clean the petroleum jelly off of the plaster bandage mask? What did you use? I always worry it will leave a horrible residue that your clay would not stick to or wouldn’t accept paint, but you did not seem to have any such issues. Maybe the layer was thin enough that it wouldn’t cause problems? If you could show this step in a video sometime, that would be awesome and much appreciated. Since the petroleum jelly was on the back of the mask, and I used a really light coat, this wasn’t a problem. The air dry clay stuck to the back of the plaster bandages just fine. I don’t think I’d use the Vaseline if it would end up on the front of the mask, where it would make it hard to paint. That is a great idea Karen, sort of a one stop place to find all the answers on paper mache. That could be really helpful to have around, there have been many times that I had to stop and look up something on the blog-if it were there in black and white, it would be a great help! It could be Paper Mache for Smarties, instead of for Dummies! Would this be terribly difficult to write?Jonni, this mask is very fine and your work is always inspiring to us. There is no way I could do this in 2 days either. It is a great idea, but I think Jackie Hall, from papiermache.co.uk, beat me to it – and did a much better job than I ever could. Check out her book, Papier Mache Art & Design. You are remarkable. As to whether your mask is more craft-sy than fine art, well, I could debate you on that point (just Google “museum quality papier mache” and see what pops up”), but does it matter? Nope, not a bit. If your work makes you happy that’s all that really matters. And you have the bonus of making other people happy, too. I have an idea for your next book if you are still thinking about it. I would love to have a reference/resource type of book on paper mache. Kind of like a For Dummies type (what a horrible title, if you are trying to learn about anything, well, the word “Dummies” just doesn’t apply.